Cowabunga! Who doesn't love the awesomeness that is the Ninja Turtles?! I remember watching all the movies when I was younger and a few years back I bought my husband all three movies. Since doing so my daughter has slowly become a fan and now absolutely loves these crazy turtles. Watching The Next Mutation: East Meets West, it definitely took me back to my childhood and how much I enjoyed watching these turtles save the day. Not only does this show teach you about teamwork, but it also teaches you that it's okay to make a mistake, not everyone is perfect. Although in this series the new evil person the turtles have to face against is Dragon Lord. Disclosure: All opinions are my own. 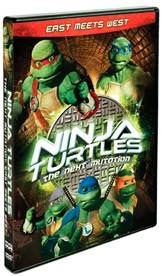 I received Ninja Turtles The Next Mutation on DVD at no cost for the purpose of this review. No other compensation was received.